On Facebook, Peggy Pine tagged us in a photo of her precious baby girl Briella! 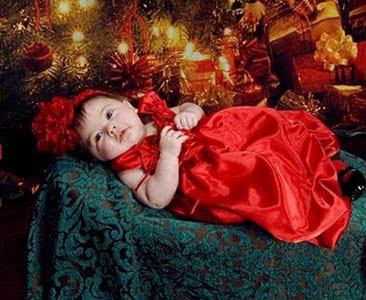 "My 3 month old daughter Briella in her Nancy August Christmas dress!" Isn't this so sweet! Baby Briella looks so elegant and sweet in her dress and this photo looks so majestic and warm! We love that big, decorated Christmas tree. I think this photograph embodies all that is charming and joyful in regards to the holiday season and baby Briella is the most beautiful gift beneath the tree! As a 3 month old baby, her dress looks a little roomy on her, but she'll definitely get another opportunity to wear it again for a future special occasion! The classic red dress is not only suitable for the holiday season; red is a lovely color that can be worn all year round! Big thanks to Peggy for sharing this photo with us. Please share with us again if Briella gets to wear her dress again! Briella is wearing our Joy To The Red Christmas Infant Dress with Ruched Bodice, Item Id: KK4048B-RD. This elegant and richly colored dress is perfect for the holidays. This particular style incorporates so many fantastic and exquisite design details and it's all at an affordable price! The sweet, little bodice is ruched and gathered, supported by dainty shoulder straps. The full skirt features gathers and pick-ups all around, making this a voluminous and magnificent skirt! A pretty and detachable bow and floral pin with ribbons accents the waist. Constructed with quality, shiny satin, this is a dress that gives to elegance for a low price! In addition, this dress style comes in a wide variety of colors, be sure to check it out! 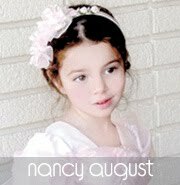 If you would like to be featured on our blog, send us a photo of your little one wearing his or her NancyAugust.com purchase to: Info@NancyAugust.com. Click here to shop for your baby dress today!